In 1985 he moved to New York City and was hired at Right Track Recording. After 2 years he became the Chief Technician. While at Right Track he worked with: The Rolling Stones, Bruce Springsteen and many other recording artists. Received record awards for his work with Foreigner, David Sanborn And David Bowie. At the same time opened his own 24 track recording studio in the Soho district in Manhattan. "When I went to New York I found I was in the right business. Having gained experience in the recording industry, Mike returned to Newton Falls in 1990. Hired by CAD, an audio manufacturing company in Conneaut, Ohio. There he commissioned recording consoles, installed console automation and was a technical recording consultant. While operating his home studio and working for CAD, Mike custom built an 80 channel recording console. At the same time he renovated the building which is now Tune Town, a modern digital and analog multitrack facility. Studio A opened in April of 1996. 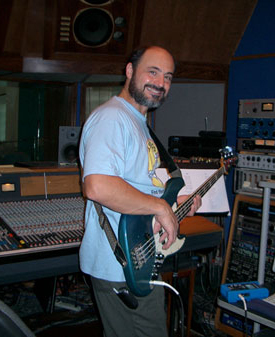 Mike has more than 30 years experience in recording. Mike is not only an excellent engineer, producer, song writer, but is a fine musician as well. A great combination for capturing a musical performance! David Bowie " Tin Machine"
David Sanborn " Close Up"
Gregory Hines " Just Me"
"The Best of Broadway Hits"